I've had a few messages today asking how to order the high quality screen printed Run Geordie Run charity t-shirts as modelled here by Soccer AM's Helen and Max. The answer is simple. Please click here. That link will take you to the order form where you will be asked to input your order details. Payment is then made securely by www.justgiving.com so the full £10 per t-shirt goes straight to the charities. Simply follow the on screen instructions. Cheques payable to either charity can also be accepted. Postage to anywhere in the world is totally free. So why delay? 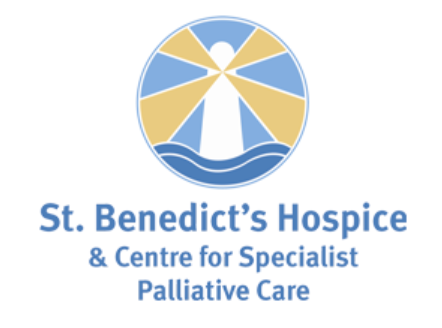 Please click this link to get your t-shirt and help change the lives of adults and children alike in our region who use the services of St Benedict's Hospice (Charity No. 1019410) and The Children's Foundation (Charity No. 1000013). Sunday 21st March - 10.5 mile run, Peter's Pies 6 Tyne Bridges Challenge. (01:32:59).PB! Saturday 27th March - 32 mile run, Battle in the Borders. (07:27:36). 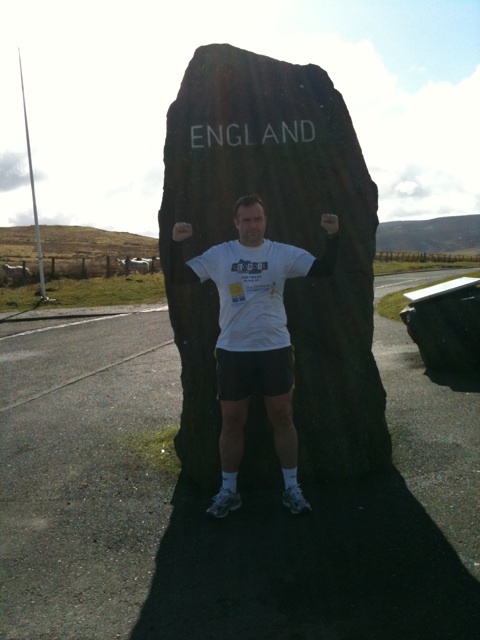 The Run Geordie Run T-shirt has been seen all over the globe. So far it has made it onto Live at Studio 5 with Melinda Messenger and Kate Walsh, Soccer AM with Helen Chamberlain and Max Rushden and Soccer Saturday with Jeff Stelling. Thats all well and good but, with respect, it has never appeared in a location as prestigious as today's. Oh yes, Ladies and Gentlemen! The Run Geordie Run T-Shirt made it in the Real Radio studios with breakfast show presenters Lisa Shaw and Gary Phillipson this morning. I quizzed the pair as to how much of the £10 selling price goes to St Benedict's Hospice (Charity No. 1019410) and The Children's Foundation (Charity No. 1000013). Gary guessed £8.25, while Lisa chipped in with £8.50. They were pretty gobsmacked, I can tell you, when they found out that the FULL £10 goes to the charities. How much? I hear you ask. YES YOU HEARD RIGHT, THE FULL £10. You pay £10 and all of it, yes all of it goes to 2 wonderful local charities. Nobody is making a penny from the sale of these t-shirts, which is exactly how we at Run Geordie Run like to do our fundraising. Over £2500 has been raised so far as a result of t-shirt sales and this money has gone straight to the charities, via justgiving.com, allowing them to make use of the money straight away. Brilliant! Production for each t-shirt was kindly paid for by nufc.com reader Peter McCowie and made, at cost price, by my friends at www.customplanet.co.uk. They are screen printed, front and back, for durable and long term use. That means they are good for the gym, the pub, the beach or even all three! Sizes available are S, M, L,XL and XXL. If you would like a t-shirt then please click here to be taken to the order form. Payment can be made by cheque or justgiving.com (which allows funds to be sent straight to the 2 charities). 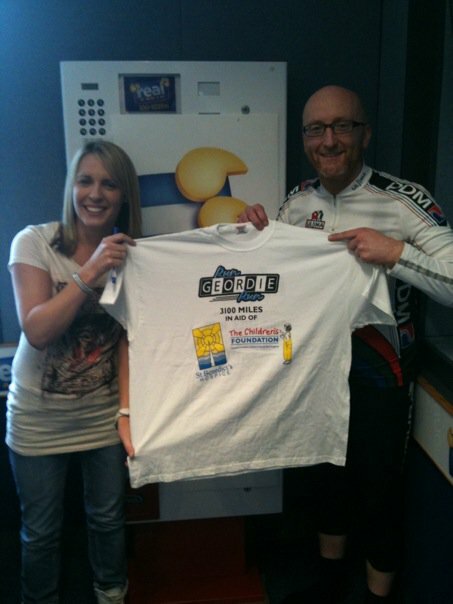 Thanks to Lisa, Gary and the 8:15 Vending Machine for posing with the Run Geordie Run t-shirt. If like me you like great banter then why don't you catch their show from 6 - 10 am on Real Radio (100 - 102 FM). A successful 32 mile "Battle in the Borders". I set off from the English/Scottish Border at Carter Bar at 10am on Saturday morning. I'd set myself a target of 07:30:00 to reach the finish line near the Military Road on the A68. Despite the numerous climbs (approx. 3850ft in total) I thought that time was more than achievable. 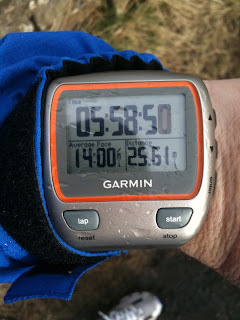 The plan was to do about 25 miles supported only by the water and nutrition in my back pack. I then intended to dump the pack when the support car turned up. The conditions were a little on the cold side but I wasn't complaining because accompanying that temperature was a nice tail wind. The first mile was done in 00:08:27 and the second in 00:09:30. That was far too quick. Perhaps I was excited about being surrounded by such beautiful scenery! The next 7 miles were far more disciplined! I had to have full concentration until the 13 mile point due to the constant traffic on the busy A68. The majority of vehicles gave me plenty of room. A few didn't! As per usual I stepped aside for the oncoming HGVs. I took on quite a bit of water, a gel and an energy bar at 13.1 miles. 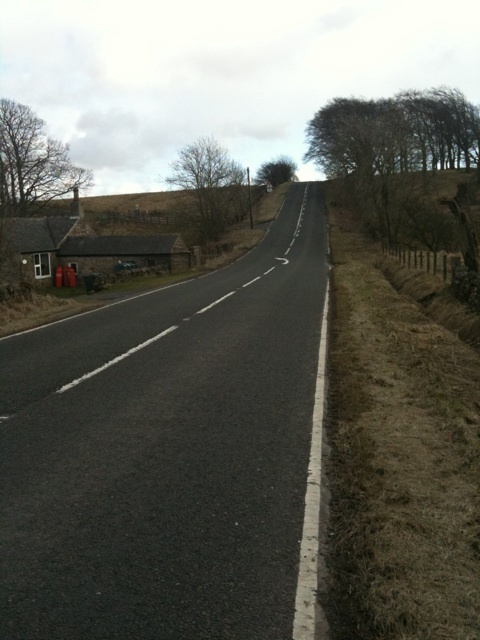 I was soon on my way again and the route started to get a bit hilly but at least I'd left the busy part of the A68. After looking at my watch and a few quick calculations, I was about 2 miles ahead of the pace that would see me finish within the set time. No problem! The next 6 miles were a mixture of climbs and descent. Up 200 ft, down 100 ft, up 100 ft, down 300 ft. 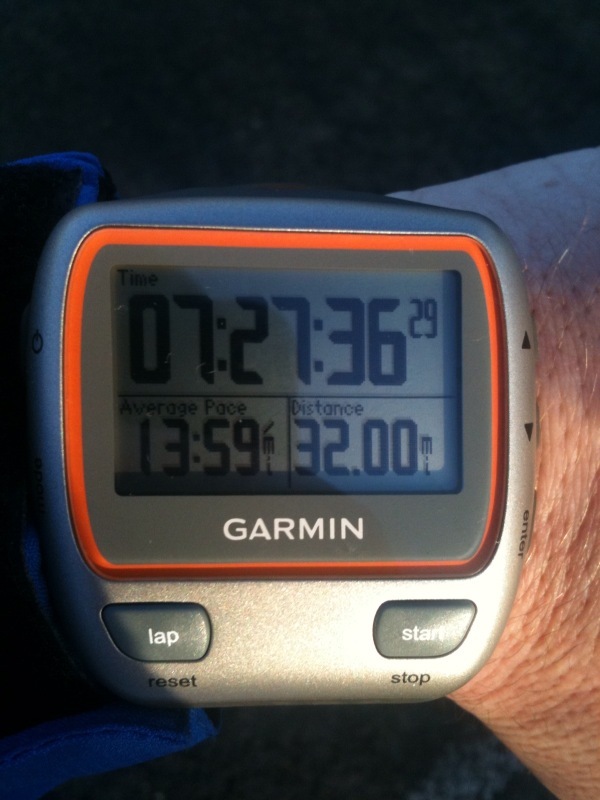 I reached the 19 mile point at West Woodburn in 03:50:00. The next 3 miles involved a 500 ft climb and due to a pain in my groin were done very slowly. The wind had also changed direction and was right in my face. By 23 miles I'd ran out of water. At least my back pack was light! The support car wasn't due to arrive for another 2 miles so I ran the next few very thirsty! I was very relieved to see Katy and Jack in the support car at exactly 25 miles. I stopped for 3 minutes or so to have a good drink and with another quick calculation I figured out that 07:30:00 was still doable. But only just! The A68 got very tricky after this with lots of blind bends and summits. I was almost knocked over on 28 miles by a car who'd taken a bend far too fast. I stepped out of the way in the nick of time. I got to the 28.5 mile point and my heart sank when I saw the huge climb ahead. I totally gave up any hope of beating 07:30:00 and I was resigned to just getting to the finish line in 1 piece. When I started climbing at the 29.85 mile point, however, it didn't seem too steep! Or at least that's what I told myself. I later found out that it was actually a 430 ft climb spread over the next 1.5 miles. I ran out of water again after 30 miles but chose to continue running rather than stop and get a drink from the support car. I screamed at myself to try and release some adrenalin and the last 3 miles were the quickest I'd done since mile 13. As a result of the quickened pace I reached the finish line in 07:27:36. Get in there!!! Without those quicker final 3 miles I wouldn't have got there within 07:30:00. My legs were very sore at the end, as was my back through carrying the pack for so long. I'm writing this blog post 24 hours after the event and I've hardly moved since I reached the finish line. My whole body is aching and mobility is not very good. I haven't had much of an appetite all day but I have had a constant thirst. 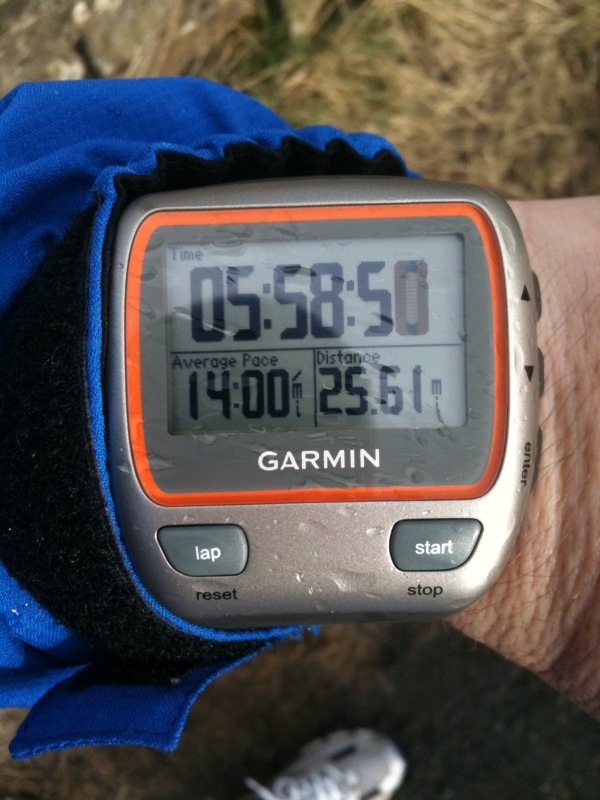 Beating 07:30:00 for this very difficult 32 mile run was not important in itself. Having a target to distract myself from the fact that I was running 32 miles was important however. Bloody hell! Did I run 32 miles! I'm pleased I didn't realise it at the time! Distraction from the bigger picture of running 3100 miles across the USA next year will be an important factor. If I ever stop for one moment and think about the run in it's entirety I'll probably never finish it. It will be a case of breaking the run down into as many small parts as possible. After that, I think I'll be breaking down those small parts into even smaller parts. The USA into individual states, individual states into miles, miles into the next lamp post, the next lamp post into the next step. That's the only way I'll be able to do the run. It's all one big distraction exercise! I've got a few short runs over the coming week before running 7 days of 16 miles a day the week after. I've also got a lot of organising and planning to do for the USA run. Oh and I'm in at Real Radio tomorrow to give an interview that will be broadcast over the Easter weekend. Busy times! I can't finish writing this post without saying thank you to all of those kind folks who sent messages of support during Saturday's run via Twitter and Facebook. What a difference it made to the final outcome! 32 done in 07:27:36. One of the most exciting runs I've ever done. I found one last bit of energy. Full report to follow. back pack in the support car. Very cold now. This hill is relentless! Wind against me now. 21 done. 11 left. Welcome to BATTLE IN THE BORDERS!!! 3 hours left to do 11 miles!!! then. 07:30:00 for 32 miles is still doable. me finish in 07:30:00. That gap is closing every mile. me. 1.75 miles ahead of the pace that would see me finish in 07:30;00. The last time I ran from Carter Bar was on the 20th July 2007. It was day 14 of my 874 mile run from John O'Groats to Lands End. I had incredible shin pain around that time that reduced me to tears. There was no way I was ever going to give up, though, as there was almost £14,000 sponsor money in the pot at that point! As it turns out, I arrived safely in Lands End 23 days later. With a final total raised of £34,108 for St Benedict's Hospice, it was just as well I ran through the shin pain in those early days around the Borders (and down to Lancaster!). Anyway! Fast forward almost 3 years to tomorrow morning and you'll find me stood in the same place (pictured), that I was back in July 2007. This time, however, there will be no excruciating shin pain and I certainly won't have run 350 miles from John O'Groats in the previous 13 days! There will be some similarities though. The charity fund this time around currently stands at £7,457. Although, it is next year's run across the USA for which that sum of money has been pledged for. I do expect the run to be as every bit as difficult as last time! It's a tough hilly course after all. As I recall, it was a 22 mile effort back in 2007. Tomorrow's route goes 10 miles beyond that. Tomorrow's route is 32 miles in total. I want to get to the finish line in under 8 hours. In fact, scrub that! 7 hours, 30 minutes will represent a good day's work. I think I'll call this one "Battle in the Borders". Watch this space (as well as Twitter and Facebook) for updates during the course of the day. I'll leave you with the words of Craig Gair who sent a message wishing me well this evening. "I'd wish you luck, but its nothing to do with luck..... you have the determination to see this one off no problem. Enjoy what you can and grit your teeth for the rest!". Run Geordie Run now on iTunes! 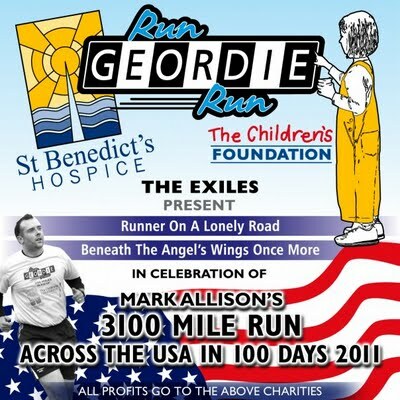 The 2 charity songs written and recorded especially for Run Geordie Run by The Exiles are now available for download in iTunes. The Exiles (aka Alan Millen and Tim Readman) kindly donated their time for free and even paid for the recording studio out of their own pockets. I took delivery of the final songs in July 2009. The first track I listened to was Runner on a Lonely Road. Within the first 10 seconds of listening to it I couldn't believe just how catchy it was. Brilliant! This was a song that delivered a message of never ever giving up and getting to the finish line against all the odds! Intertwined in all of that was also a message that the run would be done in memory and dedication of those people who were dearly important to the runner. This is evident in the lines of the song that start "I'll go another mile for.....". Next up was Beneath The Angel's Wings Once More. This beautifully written and performed piece is a lot slower in tempo than the first track and opens with the line "I'm a Geordie Boy a long way from home....". It tells a story of a lad on a very testing journey and once again there is a theme of sheer determination and of never giving up which is explained lyrically as "..no surrender, no turning back". If the first song was about the run itself then this song talks more about the return home to the North East of England. "and when it's over, I'll walk through that old familiar door, home at last, the day I stand, beneath the angel's wings once more." is a line I certainly look forward to being a reality. If there's one thing that you soon realise when you listen to the Exiles' songs it's that they don't half know how to relay a good story. Back this up with that seemingly familiar Geordie "twang" in Tim's vocals and you've got a recipe for some quality tunes that us common Tyneside folk can really relate to and in our mind's eye be a part of. You can buy the 2 songs from iTunes by clicking here. Physical CD copies are available by clicking here where payment can be made via justgiving.com. 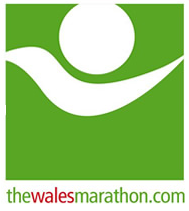 I was very flattered this week when I was invited, by the organisers, to take part in the very first Wales Marathon. The run is in September and "the course will start in Tenby and follow the coast road out and turn at Manorbier beach under the castle! Then the course will return via the ridgeway, with stunning views accross the bay, before finally finishing in Tenby's Tudor square.". Despite having ran nearly 50 marathon distances in my "career" this will be only the fifth official one I have ever done. The others being London and New York both twice each. My best official time for a marathon is 05:05:30. Surely, I can beat that time in Wales! Watch this space! In the meantime, a big thank you to Activity Wales for their very kind invitation. I'm very much looking forward to taking part. I'd better start training! The biggest test of 2010 is almost here. I've had a quiet couple of weeks since running 7 marathons in 7 days. As a result, I've been able to catch up on some Run Geordie Run admin and planning, spending a lot more time in the office and doing general family stuff. It's been a case of of ticking over for the last few weeks but that is soon about to end! The next couple of weeks will see me embark on the biggest test in training in 2010 yet and arguably of the whole USA 2011 campaign. 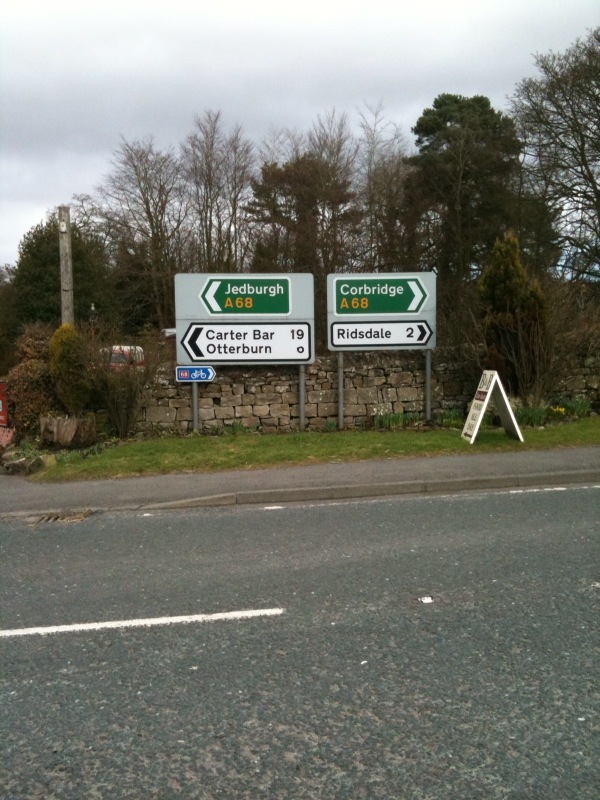 On Saturday, I'm going to run 32 miles from Carter Bar right on the England/Scotland border to the A68/Military Road junction just north of Corbridge. I'll be carrying my own supplies of water and food so the aim is to complete the run in around about 8 hours. The last time I ran this route was on day 14 of my John O'Groats to Lands End run back in 2007. I had shin splints at the time and I went to Shotley Bridge hospital afterwards for some strong pain killers! Happy days! Of course, 32 miles is the distance I'll be running on a daily basis in the USA. It's a distance I hope to get used to over the coming months! Regular readers will remember that I did a couple of 37 mile runs at the back end of 2009. This 32 mile route is lot more hillier than the 37 mile route I ran. It should be quite a test! The scheduled start time is 9am. If you're travelling around that area then why not say hello. Even better! Why not drop off some supplies or even run a few miles with me! The route is shown below. There will be little time for recovery after this 32 mile run and on Sunday morning I'll be doing the 10.5 mile Peter's Pies 6 Tyne Bridges Challenge again. I can feel my legs aching at the thought even now! I'll be having a rest day on Monday and on Tuesday I hope to make my face known at my local running club; Blackhill Bounders. After that I'll be ticking over with a couple of 6 mile runs. Following another rest day, I'll be starting 7 days of running 16 miles per day. So I'm sure you'll agree that the biggest tests of 2010 are only days away. As ever, I'll keep everyone up to date via Twitter, Facebook and my blog. Any messages of support would be greatly appreciated between the hours of 9 and 5 on Saturday in particular! I'm really looking forward to getting stuck in to the hills in Northumberland! For once, I was quite fresh going into last Sunday's 10.5 mile Peter's Pies 6 Tyne Bridges Challenge. Thanks to pace setters Lewis Edes and Mike Lewis I managed to get round in 01:32:59 knocking a good 4 minutes off my previous PB. This is the second time in recent weeks that I've knocked a good chunk of time off my previous best for various runs. I'm putting this down, in part, to the good work that masseur John Addison has put in with me. I've started running with a far more upright posture since seeing John for the first time 3 weeks ago and generally feel in much better nick. It might be some time before I get the chance to run that quick again. I'm not at the stage (and may not get to it) where I can run sub 9 minute miles within a high mileage week. 12 months ago I was smashing all kinds of PBs running short distances at a decent pace. This year, my training has changed dramatically and the sole aim is simply to get from A to B with a view to be able to run B to C the following day and so on. This strategy will be the key to completing my training injury free while allowing me to get the big miles done. There will be times, just like last Sunday, where I'll throw caution to the wind and just try to run as fast as I can. Those occasions won't come about that often however between now and August 2011. There will be a lot of sponsor money for St Benedict's Hospice and The Children's Foundation riding on the successful completion of the run across the USA in 2011. Self preservation and discipline are the order of the day now. Sunday 14th March - 10.5 mile run, Peter's Pies 6 Tyne Bridges Challenge. (01:47:35). Wednesday 17th March - 2 mile run, Treadmill. (00:18:49). Wednesday 17th March - Personal Training Session. (01:30:00). Saturday 20th March - David Fairlamb's Beach Bootcamp. (00:45:00). Saturday 20th March - 6 x Steps in King Edwards Bay. (00:19:10). Where to catch Run Geordie Run over the next few weeks. Run Geordie Run will be featuring in several media places over the coming weeks starting with a mention in David Fairlamb's regular column in the Journal tomorrow. I'm not sure exactly what he's written about so I'm hoping that it's all good! I was informed yesterday that the recent interview with Tyne Tees will appear on North East Tonight next week. I'm really looking forward to seeing how I fare on the big screen! On Monday I had some photos taken with none other than ex NUFC midfielder, Paul Bracewell. This was to publicise the up and coming Run Geordie Run World Cup in aid of The Children's Foundation which is to be held at Complete Football, Gosforth. This item will hopefully appear in the Evening Chronicle next week. Watch this space very soon for further news on the Run Geordie Run World Cup tournament and how to apply to take part. I recently appeared in Northern Running Guide. This is a free publication which lists all of the up and coming races in the North of England as well as some interesting articles on various aspects of running. Why not pop into Northern Runner (just down from The Gate), Newcastle and pick up your free copy. While you're there you should also try on a pair of Brooks trainers! Finally, I'll be giving an interview to Real Radio on the 29th March. This will be broadcast over the next Bank Holiday Weekend. Exciting or what! As you can see the Run Geordie Run PR machine has started rolling. I must given a thank you to the photographers, cameramen and journalists involved for helping to spread the word. Over £2400 has been raised so far as a result of t-shirt sales and this has helped the overall charity fund reach the current total of £7,307. Each Run Geordie Run T-Shirt, as shown here by Toon fan Neil Whittaker at the Newcastle v Scunthorpe match, is priced at £10 each. Now guess how much of your £10 goes to charity? THE FULL £10!!!!!!!!!!!!!! Your eyes are not deceiving you. You read it correctly folks. You pay £10 per t-shirt and all of it goes to the 2 charities. This is the way we like to do our fundraising at Run Geordie Run! 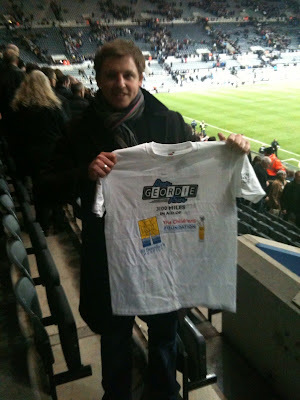 Thanks to Neil for posing with his Run Geordie Run t-shirt. I've sat next to Neil for the last 2 seasons and he only just recently realised that it was me who was planning to run across the USA after reading about me on nufc.com and putting 2 and 2 together. I'd like to join the countless numbers of people and pay my condolences to the friends and family of Jimmy Bell who sadly passed away today following a brave fight against cancer. A kinder, friendlier and more modest person you are never likely to meet. Week 70 got off to a difficult start with a 13.1 mile Peter's Pies 6 Tyne Bridges Challenge. The reason why that run was so tough was due to the fact that I'd ran far too fast in the Pennines the previous day. It was quite pleasing to knock 7 minutes off my previous best though! I learned a lesson from that lack of discipline and the aim for the rest of the week was to keep each mile around about the 10 minute mark. With 7 half marathons to get through, I think that approach was quite sensible. I think this paid dividends as not once did I ache after a run. In fact, I remember waking up each day thinking that there didn't seem to be any physical evidence that I'd ran a half marathon the previous day. I did suffer a bit with dehydration on Thursday and Friday but I soon got that under control. The one effect that all of the running had was to my level of tiredness, which was extreme most days! A few early nights helped cure that though. It's been a busy week where I've had to fit my running around The Children's Foundation AGM on Monday, a massage on Wednesday, the Tyne Tees shoot on Thursday, the talk at Northumbria Uni on Friday and the match on Saturday! Needless to say I wasn't in the office much last week! I doubt I would get away with that type of schedule in 4 weeks time when I'll be running 16 miles per day for 7 days or 4 weeks after that when it's 19 miles per day for 7 days. I can't afford that amount of distraction on these big running weeks. I just about got away with it this week. I started week 71 with the Peter's Pies 6 Tyne Bridges Challenge. Yet again at the end of the run I felt as if I hadn't even ran at all. This tells me quite a bit about where I am with my training given that I'd ran 113.7 miles in the previous 9 days. I've learned important lessons this week. If I cut out the distractions and keep the pace sensible I've got a very good chance of getting through the next big test relatively unscathed in 4 weeks time. 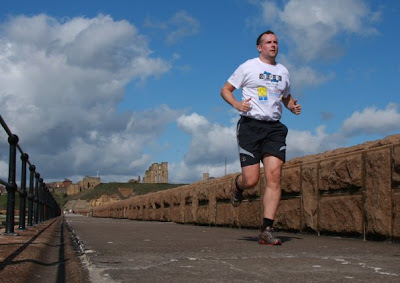 Please click the image below to order your Run Geordie Run t-shirt. Postage to anywhere on the planet is free. Yes free! Sizes available are S, M, L, XL and XXL. They are £10 each. And here's the good bit. Thanks to Peter McCowie and Custom Planet the full £10 goes to St Benedict's Hospice (Charity No. 1019410) and The Children's Foundation (Charity No 1000013). You pay £10 and the charities receive the full £10. Simples! Sunday 7th March - 13.1 mile run, Peter's Pies 6 Tyne Bridges Challenge. (02:17:50). Monday 8th March - 13.5 mile run, Gosforth, Fawdon, Jesmond Tour. (02:10:38). Tuesday 9th March - 13.1 mile run, Gosforth to Hamsterley Mill. (02:16:52). Wednesday 10th March - 10.6 mile run, Gosforth Tour. (01:57:34). Wednesday 10th March - 2.5 mile run, Treadmill. (00:28:17). Wednesday 10th March - Personal Training Session. (01:30:00). Thursday 11th March - 13.1 mile run, Treadmill. (02:10:33). Friday 12th March - 13.1 mile run, Treadmill. (02:09:43). Saturday 13th March - 13.2 mile run, Treadmill. (02:21:11). Sunday 28th February - 10.5 mile run, Peter's Pies 6 Tyne Bridges Challenge. (01:47:00). Thursday 4th March - 5 mile run, Race Course. (00:47:23). Saturday 6th March - 11 mile run, Shotley Bridge to Whittonstall and back. (01:40:55). PB! I'm pleased to report that tonight's 13.2 mile run brings a close to a succesful week 70 of training. I've hardly got the energy to type any more for now. I'll post my thoughts on this week's training tomorrow. In just over 9 hours I will be starting week 71 with the 10.5 mile Peter's Pies 6 Tyne Bridges Challenge. I'm really looking forward to a rest day on Monday! I will have ran 114.5 miles in 9 days by then so a rest is very well deserved. Week 70 almost in the bag. What I have experienced, though, is a little bit of de-hydration on a couple of days. Will I ever learn! Worse than that has been the tiredness! I've never had so many early nights as I have this week! To bring week 70 to a close I have the small matter of my last half marathon of the week tomorrow. I'm going to treat myself to a lie in so the run will be done when I get back from the Boro match. If Newcastle get the 3 points then I'll be well up for the run. Howay lads! Don't let me down! I had the pleasure of talking to a group of students at Northumbria University today. 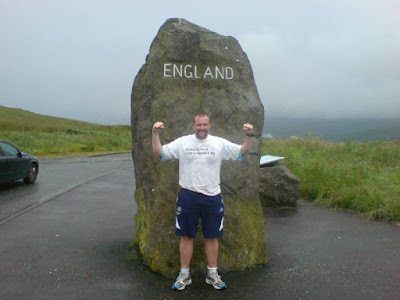 The aim was to try and recruit some more members for the Run Geordie Run USA 2011 Support Team. I only had 10 minutes in which to talk about my background, the 2 charities, the facts and figures of the trans USA run, the expected duties of the support team and all that it entails. I just about got the message across in that time with a few questions afterwards. I was very grateful to those students who wouldn't be able to join the team but took time out anyway at the end to wish me good luck. For those students (and any other reader for that matter) who would like to apply to join the team then the application form can be found by clicking here. Thanks to Brooks Sports (again!). Once again it's time to give a special mention to my kit sponsors Brooks Sports. In the last few weeks they've sent me a few pairs of my favourite running shoes (Brooks Glycerin) and base layer tops (Brooks Equilibrium). I'm ever so grateful for their continued support and as this run is being paid for out of my own pocket, any chance to keep the costs down is very much welcomed. 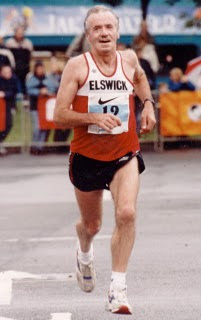 Ever since I ran from John O'Groats to Lands End in 2007 I've worn Brooks Glycerin. They are a wonderfully comfortable shoe. The fact that I've ran 6 half marathons so far this week without a single blister or graze is testament to their comfort and fit. Of course, my shoes are supplied by Brooks Sports so I may sound biased when I speak of their quality. I should say that I bought my own Brooks shoes for the John O'Groats to Lands End run back in 2007. It is with that in mind that I would recommend that any runner to get themselves down to Northern Runner in Low Friar Street, Newcastle (Just down from The Gate). If you have a neutral running style like me then why not try a pair of the Brooks Glycerin for size. If not then get the staff at Northern Runner to check your feet out and recommend the pair of Brooks shoes that suit your style. I'm confident you won't be disappointed! Stop press!!! I'll be on North East Tonight on Tyne Tees next week. i.e. week commencing 12/03/2010. Watch out for me on Tyne Tees TV. I spent this afternoon filming a piece for the local news programme North East Tonight. The film crew took some footage of me running on Tynemouth Beach and then I gave a face to face interview at David Fairlamb's gym. I thought it all went very well. After the event, as ever, I thought of things I should have said or could have said differently. I must admit I got a bit choked up when I talked about leaving Katy and Jack for over 3 months while I'm off running across the USA. Overall though I was very pleased, with my contribution to the whole thing and I'm sure after some neat editing it will come across well. There is a good chance that the item will be shown on tomorrow's programme at 6 pm. Failing that, it will be early next week. Please watch out for me on Tyne Tees TV. I'd appreciate any feedback or opinion after you've seen the piece. You can get in touch at sponsorship@rungeordierun.com. This week I have been mostly running 1/2 marathons! It's week 70 of training for USA 2011. Today I ran my 2nd 1/2 marathon in 2 days. Today's route, a big loop 13.5 mile one around Gosforth, was done in 02:10:38. Yesterday's 13 mile effort was an extended Peter's Pies 6 Tyne Bridges Challenge took 02:17:50. I suffered a bit on this one due to a quick 11 mile run on Saturday which had 5 x 8 minute miles and a 7 minute mile in it. That's far too fast for me given what I'm trying to achieve this week. i.e. 7 x 13 mile runs. Will I ever learn! One thing I have noticed since last week's back massage is that my posture has greatly improved and I've got a much better technique as a result. For me, better technique means better breathing and better breathing means better rhythm. This was evident on Saturday with those quick miles. I've got another 5 half marathons to do between Tuesday and Saturday this week. The aim is to get each mile as close to 10 minutes as I possibly can. This will be the key to getting all 91 miles done this week. A repeat of Saturday's pace would be foolish! David Fairlamb arranged for me to have a back massage from one of his associates today; John Addison. My back pain had been getting only very slightly better and has been limiting by pace recently. I'm glad to report that the excruciating pain endured during today's massage seems to have done the trick. The real proof of the pudding, however, will be during tomorrow's run when I've got an easy 5 miles to do. I've got a further easy run on Friday and an 11 mile run in the North Pennines on Saturday morning. Next week is my second so called "Red Week" of the year. This is where I have 7 days of consecutive high mileage.The first Red Week was 4 weeks ago where I ran 10 miles a day for 7 days. Red Weeks occur every 4 weeks with the final one in mid August where I'll be running 32 miles a day for 7 days. Next week's Red week is 13 miles per day, starting with an extended Peter's Pies 6 Tyne Bridges Challenge on Sunday. I don't have any school runs to do and will be reducing my hours at work so everything is set up for a successful week. With further massage from John I should be in much better shape over the coming months. Thanks to David Fairlamb for arranging the sessions with John Addison. Thanks also (I think!!) go to John for donating his time for free and for inflicting so much pain that seems to have cleared up my back problem. The current route that I'm using to run across the USA next year starts at Huntington Beach, California and finishes in Central Park, New York. There is one problem with this. The run will start at the Pacific Ocean but will fall short of the Atlantic Ocean by 20 or so miles. It would be a shame to travel all of that way and end up with the run not being a true coast to coast venture. Finding an end point for the run has been on my to-do list for quite a while now. With the help of Caroline O'Doherty from The Children's Foundation (and her sister in law in New York) I've decided to bring the 3100 mile run to an end at Coney Island. Wikipedia has the following to say about the location of my new found "finish line". "Coney Island is a peninsula, formerly an island, in southernmost Brooklyn, New York City, USA, with a beach on the Atlantic Ocean.". The thing that swung it for me, though, is the fact that they have their own Hot Dog eating competition! Last year's winner managed to eat 68 hotdogs and buns in 10 minutes! I reckon, having just ran 3100 miles, I may be able to beat that! In the meantime, it's official. My 3100 mile run across the USA is a true coast to coast route! Starting to think about the logistics. I dedicated last night's free time to pricing up flights to and from the US, looking for a hotel in LA and New York and starting the VISA application process. I didn't have too much luck I'm afraid. The departure date is too far in the future for flights and hotel bookings. More annoyingly though was the fact that my online VISA application session "timed out" mid application. When the session timed out, I was at the point in the application where it asked "Where will you be staying"? "Hmmmm, ermmm, arl owa man like"!. Which for readers outside of Newcastle translates to "All over old chap". I'm going to leave the VISA application until I can book flights and a hotel. Most sites won't allow you to book more than a year in advance so it looks like this is a job for May 2010. I then decided to issue an appeal to the 1360 members of my Run Geordie Run Facebook group and to my 300 followers on Twitter. The appeal was for anyone who had access to discounted flights and hotels in LA and NY to get in touch. I've had a couple of good replies but I think it's appropriate to mention one particular person at this point. Ladies and Gentlemen, it gives me great pleasure to introduce the latest member of the Run Geordie Run team; Shelli Tench Mayfield. Shelli lives in the USA and with her best friend being a Geordie she knows what people from our region are all about. 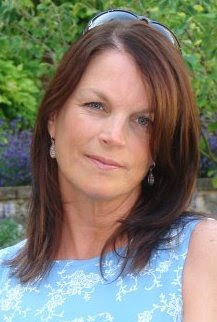 Shelli is currently in the process of creating a PR plan for me "stateside". I don't want to go into any details at this early stage, needless to say that I'm very excited about her plans and even more so with her dedication and effort so far. Aside from PR, it's very comforting to have a good contact in the USA. All of a sudden the whole thing seems a little less daunting than before with access to local knowledge such as Shellis'. Thanks to Shelli and thanks to all of those folk who have written to me with advice on various aspects of the run and also on fundraising and publicity. The virtual community of helpers and advisors is growing by the week. It's great to have you all aboard. I've said right from the start that the USA 2011 run will be a team effort. It's me putting one front in front of the other a few million times but I'm sure a lot of credit will go to those people behind the scenes who contribute, advise and help out.